Good Morning & Happy Sunday Stamping Friends!!!!! It's a new challenge @ 613 Avenue Create & our theme is to incorporate at least 3 different shapes into your creations. For example, hearts, stars, circles, squares....you get the idea right? 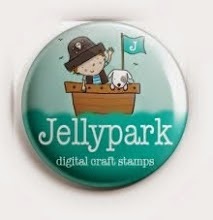 One of our sponsors this time around is Jellypark & my bear is already holding a star so I added the circles along with the square punch....another fabulous male themed creation checked off my list!!!! My teammates also made awesome works of art so check out our blog to see what they made & while you're there; read up on our rules so you can play along with us! I'm looking forward to seeing what you all come up with....have fun & happy stamping everyone!!!!! CRAFTITUDE ~ Anything Goes/That's Die-licious! Thanks so much for stopping by & have a great rest of the day!!! Oh my gosh, I love those colors! I also NEED to get that embossing folder. I think your card turned out really cute! Awww, so cute! You've made the Teddy's fur look so fluffy with your coloring technique and the neutral colored background allows the image to get the attention it deserves. Nice job, Jackie! Jackie - what a great card! I love that you combined that wonderful DP with the cut embossed plain beige one. The ribbon and the pearls are so perfect on that paper. An interesting juxtaposition of elegant and the more primitive image - and it works! Such a beautiful card, colours and image, ....thanks so much for joining in our challenge at SPS this time...Annie [DT]. Superb Male card, thanks for joining us at A Creative Romance for our 'One For the Boys' Challenge. Beautiful card Jackie. Love your colouring.